With Matt Kemp on the disabled list, Dodgers will recall a ‘true center fielder’ soon. Of all the frustrations Matt Kemp has had to deal with this season, a trip to the disabled list was not among them — until Thursday. 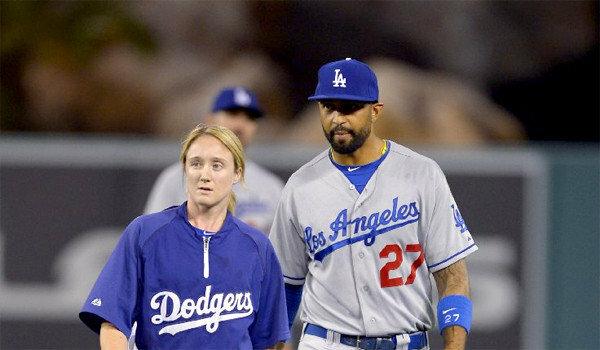 Kemp is optimistic he can return once his 15 days are up, which projects to June 14 at Pittsburgh, after straining his right hamstring Wednesday night in Anaheim. “It’s disappointing,” he said. “I love playing baseball. I hate being hurt. This is my second year of being hurt. Dodgers manager Don Mattingly also sounded optimistic that Kemp could return once his 15 days are up. Tim Federowicz was recalled from Triple-A Albuquerque and is starting at catcher tonight against the Angels. He might be behind the plate tomorrow, too, with starting catcher A.J. Ellis nursing a strained left oblique. Ellis needed two days off for a similar injury in spring training, Mattingly said, and the team expects a similar timetable this time around. Andre Ethier is playing center field against the Angels, but Mattingly said that’s a temporary move. Ethier has played two games in center field in his major-league career. One came last year. The first came at the 2010 All-Star Game, which coincidentally was played at Angel Stadium. “We need a true center fielder,” he said. Assuming they stay within the organization, the Dodgers have options. Among them are Double-A prospects Joc Pederson or Yasiel Puig. Puig is not a natural center fielder. Pederson is. But the two are 22 and 21, respectively, and general manager Ned Colletti reiterated recently that he still considers the two players to be developing. Rather, Mattingly said the team will probably look to Triple-A to fill the position. Tony Gwynn Jr. has played 18 games in center field for the Albuquerque Isotopes this year and is batting .288/.359/.360. Matt Angle has played 29 games in center, and his game is also built more around speed than power (.293/.378/.440). No one else has played more than 10. Neither Gwynn or Angle is on the Dodgers’ 40-man roster, however, so the team may turn to Elian Herrera to man the position in Kemp’s absence. Herrera has played 66 minor-league games in center field the last five seasons, and nine games there with the Dodgers last year. He is batting .304 with four home runs, 23 RBIs and 11 stolen bases in 44 games at Albuquerque this year. He had one hit in three at-bats during a brief stint with the Dodgers in April. Herrera, Gwynn and Angle don’t have the power bats to replace Kemp, but Mattingly made it clear that is of little concern. This entry was posted in JP on the Dodgers, On The Farm and tagged A.J. Ellis, Albuquerque, Andre Ethier, Elian Herrera, Joc Pederson, Matt Angle, Matt Kemp, Tim Federowicz, Tony Gwynn Jr., Yasiel Puig by J.P. Hoornstra. Bookmark the permalink.